Robert Simmons’ Simply Simmons brush line was created to provide the artist with a versatile range of short handled brushes, made with traditional Simmons craftsman-ship and offered at ONE LOW PRICE. 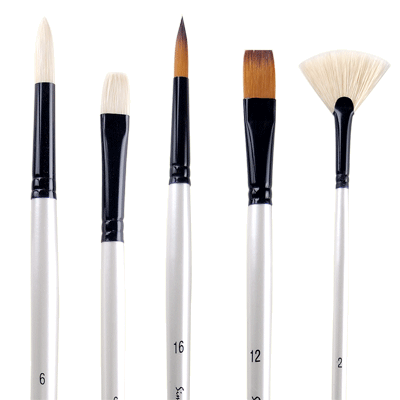 The Simply Simmons long handle range of 36 synthetic brushes includes all of the most popular styles and sizes in a mix of synthetic hair and natural Chucking bristle, specifically designed for oil painting. In addition, there is a wide selection of Simply Simmons brush sets offering different natural hair brush styles such as the large Oval & Pointed Wash Brushes, Mops, Bigfoot Bristle Stipplers, Scumblers and Brights. These sets are packaged in a clear vinyl re-usable wallet, for added value and convenience. Like all Robert Simmons brushes, the Simply Simmons range is handmade in their facility, by skilled craftsmen using the same techniques and strict standards as all Robert Simmons artist brushes. Artist quality materials are used exclusively including the single thickness dark-tipped synthetic filament, seamless brass and aluminum ferrules and kiln-dried and lacquer dipped birchwood handles. All heads are resin bonded and crimped to handles to insure a permanent fit that won’t loosen up with repeated use. For PERFORMANCE, DEPENDABILITY and VALUE, It’s Simply Simmons.